Monday, August 6, 2018 at 3:45 p.m.
On July 17, 2018, a fire broke out near the 6400 block of East Upriver Drive. 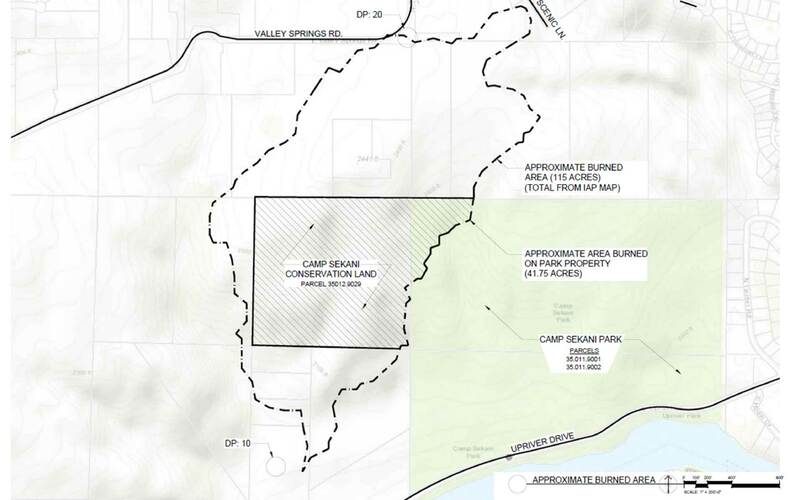 Over the next several days, 115 acres of public and private land were impacted by the fire including 42 acres of Parks & Recreation owned Camp Sekani Park. While the fire is now fully contained, Department of Natural Resources (DNR) crews will continue monitoring the site. Evergreen East Mountain Bike Alliance has already put in over 55 hours of volunteer trail work to mitigate damage caused by the fire, but there is much more work to be done to restore the area. Evergreen will continue trail work in coordination with Parks & Recreation and the DNR to put Camp Sekani Park back on track for many more years of recreational enjoyment. Be aware of your surroundings; watch out for holes, hot spots, loose soil, downed trees, stressed and unstable trees. Be sensitive to the unstable soils which are now very susceptible to erosion. Stay on the established trails and roads (no trail braiding). After completing any potential fire line restoration work, we can address next steps for improving public access and restoring the trail system. Ongoing trail monitoring and maintenance will continue as erosion events and additional possible tree failures occur. Ponderosa pine forests are well adapted to fire, and nature will do much of the restoration work. Parks and Recreation staff will continue work with the DNR, Evergreen East, and NE Region Foresters to determine an action plan to support, supplement, and accelerate the natural processes. Get involved with restoration efforts by volunteering with or joining Evergreen East Mountain Bike Alliance.